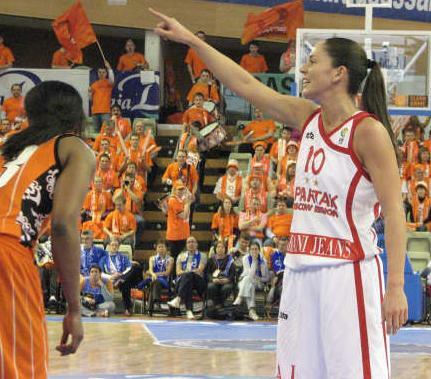 The EuroLeague Women 2009 final match will be between the two-time defending champion Spartak Moscow Region and the hosts of the final-four weekend Halcon Avenida. Spartak Moscow Region beat Russian Super Leagues rivals UMMC Ekaterinburg (83-74) in the first semi-final. Diana Taurasi was the star of the show with 33 points. Yet it was the calm play of Sue Bird (above) and her clutch shooting in the final quarter that saw the defending champion through. Bird finished the match with 17 points. Agnieszka Bibrzycka led the scoring for UMMC with 23 points and French international Sandrine Gruda contributed 12 points and 8 rebounds in defeat. László Rátgéber who is in his first season as head coach of Dynamo Moscow Region was satisfied with his team’s defending in the second half and is looking forward to the final on Sunday. The second semi-final did not have the fireworks of the first game and was played at a slower tempo. 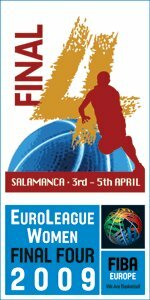 The hosts, Halcon Avenida, ran out winners against MKB Euroleasing (85-78). The America duo Michelle Snow and Le’CoeWillingham combined for 37 points in the victory. 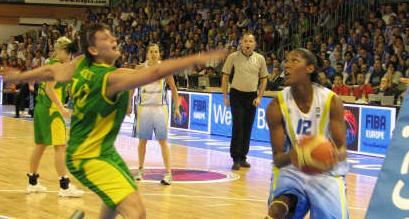 Former LFB star Gunta Basko contributed 10 points. For MKB it was a case of missed opportunities, Amber Holt scored 23 points and her side fired 10-of-23 from beyond the arc but allowed the hosts too many second-chance opportunities. The first half of the game belonged to Diana Taurasi as she scored 22 points for Dynamo Moscow as they led UMMC Ekaterinburg (44-41) at the interval. She fired in 4-of-6 from beyond the arc. All in all Taurasi finished with a game-high 33 points. In a very technical first period it took a three-pointer from Taurasi with three minutes on the game clock to get Dynamo Moscow Region going. Soon afterwards Sue Bird scored and then Lauren Jackson fired in a shot from the land of many as Dynamo opened the first significant lead of the game (12-4). Gundars Vetra, the UMMC coach, called for a time-out and calmed his players down. The result was the team started to find their way to the basket scoring 6 points. UMMC also became more physical which resulted in a minor clash between Lauren Jackson and Agnieszka Bibrzycka. Jackson was taken out of the game to be cooled down by László Rátgéber. Sylvia Fowles continued to dominate inside the paint for Dynamo Moscow which resulted in Sandrine Gruda given way for Asjha Jones. Dynamo Moscow Region edged the first period (21-17) with 10 points from Taurasi. Penny Taylor came to life in the second period with 5 quick points to tie the game (24-24) with just over 12 minutes played. Jones and Maria Stepanova double-teamed Fowles. But it was the return of Taurasi that got Spartak Moscow Region going with 5 straight points (31-26). The two teams traded basket for basket for the rest of the period. Spartak Moscow Region went into the interval ahead (44-41) thanks to a buzzer-beater baseline jumper from Fowles. The third quarter was end to end basketball with Spartak Moscow stretching their advantage with good three-point shooting and scoring from Tatiana Shchegoleva to lead (64-58) going into the final period. UMMC came out aggressively at the start of the last quarter to score the first 6 points. Taurasi hit her first three of the second half of the match from the baseline for Spartak Moscow to hold onto the lead (67-64). Then Cappie Poindexter and Bird ran into each other which resulted in Bird going to the bench for a few seconds. UMMC’s foul problems became complicated with Taylor and Poindexter on 4 fouls early in the final period. Spartak Moscow took full advantage as Bird fired in a shot form down-down (70-66). Bird continued to find space for her side to increase the lead (76-68). Spartak Moscow held off the late challenge of UMMC to win the game (83-74). You can pick up the game statistics here. The match is also available with commentary from Jeff Taylor in English here. Michelle "Donette" Snow was the dominate player during the first five minutes with 7 points as Halcon Avenida opened up a 10-point lead (15-5). After a time-out by Norbert Székely, the MKB EuroLeasing head coach, things improved as his side went on a 9-1 run with Amber Holt and Zsuzsanna Horváth coming up with big shots to reduce the deficit (14-16). Snow started to look tired and took a small break while Isabel Sanchez made here entry for the home side. She made an immediate impact in drawing a foul and hitting two free-throws. With the clock running down as the quarter was coming to an end Anke De Mondt was left open to hit a three-pointer for Halcon Avenida to lead (21-14). Compared to the first semi-final, this game was played at a slower pace. Halcon’s advantage in rebounding enabled them to hold onto the lead. Holt was the main offensive weapon for the guests. But once Sanchez started to fire in from the land of many, Halcon Avenida’s advantage moved into double digits (41-29). Then the hosts went to sleep and Kathleen MacLeod took full advantage to score 4 of her team’s 6 points including the period-ending buzzer beater as MKB reduced their deficit by the interval (35-41). There was drama right at the start of the third quarter as Snow turned he ankle and had to leave the court for treatment after only 15 seconds on court. Dóra Horti took full advantage of Snow’s absence and scored 5 points. In addition Holt was all over the court as the guests did not allow the hosts to escape. Le'Coe Willingham and Petra Stampalija kept on scoring in the paint for Halcon Avenida as their opponents held on to their lead (55-47) with 26 minutes played. Holt - firing a shot from well beyond the arc - and MacLeod - driving to the basket for 2 points - as MKB EuroLeasing tried to out-manoeuvre their hosts. Halcon Avenida’s control of the offensive boards by Snow and their transition game enabled them to restore an 8-point advantage going into the final period (61-53). Jelena Milovanovic was having a match to forget for MKB. When she missed a three-point attempt, her coach immediately took her out of the game. She was replaced by Tijana Krivacevic who turns 19 years next week. Krivacevic became the main offensive threat with 4 points. However a three-pointer by Silvia Dominguez for the hosts allowed Avenida to maintain the advantage (68-57) with six minutes to play. MKB continued to allow the hosts to score easy points inside the paint and with the game entering money-time they trailed by 12 points (62-74). Edit Ratkainé was fouled by Sanchez while shooting a three-pointer. She was rewarded with 3 free-throws which she scored. Unfortunately MKB kept on letting Halcon Avenida score easy points in the paint which negated their outside scoring to allow the hosts to keep the advantage. Halcon became careless in the last 30 seconds. So MKB were able to reduce the deficit (75-81). Halcon then made things more difficult for themselves with some unnecessary fouls but had enough points in the bag to win (85-78). Le'Coe Willingham led the scoring with 20 points while Snow finished with 17 points and 18 rebounds for the guests while Holt fired in 21 points.